We're here to help with any queries you have. Below you will find the most frequently asked questions about some of our products and services. Whether this is your first time visiting KeyWaste or you're a returning customer, we hope that the following FAQ answer your query. Yes, we do provide glass collections in Dublin. For more information please click here. Do you collect clinical waste? Yes, we do provide clinical waste collections in Dublin and the surrounding counties. For more information please click here. Can you collect from a basement? If you need your bins taken from a basement please contact our office on 01-4299846 for more information. What waste goes in my brown bin? 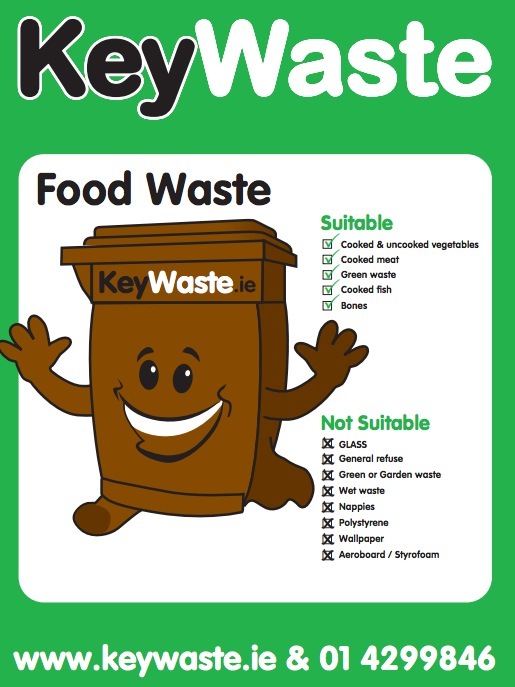 Please click here for a list of items that can and can’t be disposed of in your brown bin. What waste goes in my green bin? Please click here for a list of items that can and can’t be disposed of in your green bin. What waste goes in my black bin? Please click here for a list of items that can and can’t be disposed of in your black bin. What is your waste permit number? Will you collect from me if I do not have an account? No, we only provide a scheduled collection service. Please click here if you would like a member of our sales team to contact you. Do you collect from residential houses? 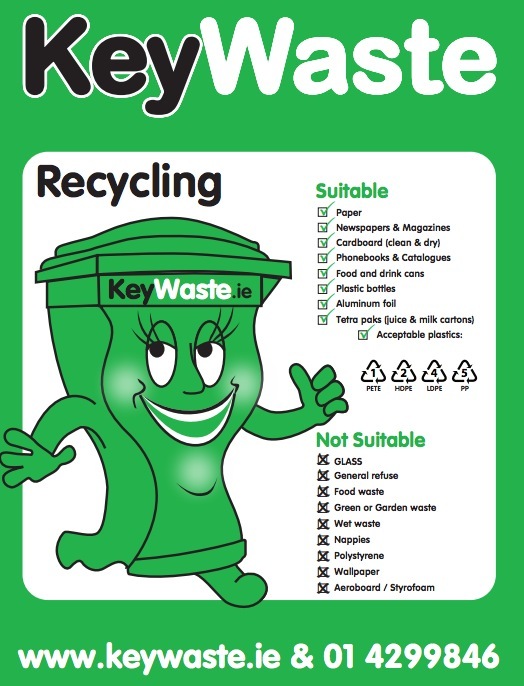 KeyWaste are predominantly a commercial waste provider however we do collect from managed properties such as flats and apartments. What is your skip permit number? Our skip permit number is 33. We are located in Greenview, Greenhills Road, Walkinstown, Dublin 12. Please see KeyWaste on Google Maps for more information. Where do you tip your waste? How do I get a bag and tag service from KeyWaste? 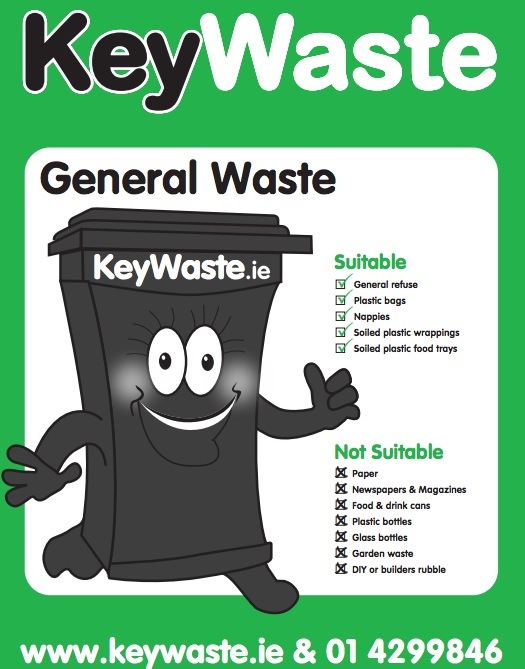 Simply call KeyWaste on 01-4299846 to organise setting up an account. Will you accept cash as payment for bags and tags? Yes, we can set your business up as a cash account in which you must pay cash on delivery for your tags. Your general waste bags can weigh no more than 15kg (33lbs) if your bag weighs more than this it will not be lifted by our drivers for health and safety reasons. What areas do you cover in Dublin? We cover all areas of Dublin South, North, East and West. How much cardboard can be used per one tag? No more than 15kgs of cardboard can be used per tag. Our office opens from 9am-5.30pm Monday to Friday and 9am-1pm on Saturday. What time do your drivers start collecting? Our daytime drivers leave our yard at 6.30am and our night time drivers leave our yard 6pm. What time do my bins/bags need to be out from? If you are on a DAYTIME collection your bins need to be out and accessible from 6.30am. If you are on a NIGHTTIME collection your bins need to be out and accessible from 6pm. We tip our waste in various licensed waste transfer and recycling facilities. Can I buy a bin from you? Yes, you can purchase a bin from us. Please contact our office on 01-4299846 for more information. Simply fill in our online enquiry form or contact our customer service office on 01-4299846 and we will organise a sales representative to call you to discuss your individual needs.